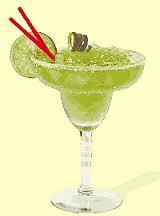 Don Pablos Real Margarita drink recipe made with Cointreau,Lime juice,Sugar,Tequila,. How to make a Don Pablos Real Margarita with all the instructions and ingredients. place tequila, cointreau, and fresh sqeezed lime juce, and powedered sugar in a 16 oz beer glass. fill the rest with ice, and shake for at least 30 seconds to disolve the powdered sugar. strain it in to a martini glass, or serve on the rocks....DO NOT BLEND. Adonis 2 View This Recipe! Adons Eclips View This Recipe! Don&apos;t Stand Up Too Fast View This Recipe! Don&apos;t Worry About It View This Recipe! Donald Cox View This Recipe! Donger Zima View This Recipe! Viva Villa View This Recipe! I worked at DP's for 8 years. This recipe is exact, except there's a little more Cointreau. And they are right...don't serve this frozen, it gets extremely watered down that way. It's a decent drink, but it should be called Don Pablos I Made It Up Drink.